Smack. Twang…Smack…twang…Smack…twang…..The lightening impact and deafening strike of knuckles on canvas. The fist, the primary weapon of the martial artist making contact with the Makiwara. The vibration of that blow shaking the board to its earthy foundations. Swoosh, smack, twang….the sound of a devastating mashiwa geri roundhouse kick flying towards the rice straw target. Smashing into it – transferring the whole energy of the human body followed by stillness, only the echoing twang of the board as it shakes betrays the action. In Japanese Karate the Makiwara is a fundamental aspect of traditional training. It’s how we test and condition ourselves. The same is true for many other arts – the heavy boxing bag, and life-like human dummy, the classical kung fu wooden dummy. Providing their own unique attributes and benefits they allow us to unleash the full fury of techniques striking with devastating force, unrestrained and free. Perhaps, more then any other part of our bodies, as martial artists we abuse our wrists and ankles. These delicate joints suffer the impact of our strikes and blows and even the slightest misalignment can results in devastating injury. Worse still injury of these joints can lead to more than just unwelcome interruptions of our training, but downtime from our jobs and family duties. In today’s working environments many of use computers which strain our wrists and can lead to carpal tunnel syndrome and tendinitis as it is. 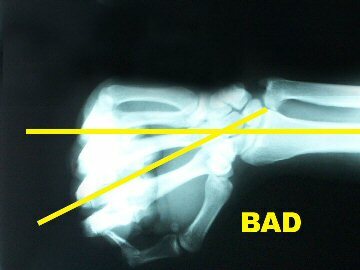 A busted wrist can keep you from working properly, memos could be illegible and deadlines missed. As a martial artist I’ve had my fair share of injuries and as an acupuncturist, fitness instructor and author I know how difficult it can be to work with an injured arm or wrist. The same is true for our ankles – pain can prevent us pushing the peddles of our cars, a killer when commuting on public transportation and a downright drag when standing. House hold work is out and you can forget the shopping or playing with the kids. Being laid up on the couch becomes frustrating and stressful and it’s all too easy to take the anger of inactivity out on those you love. Luckily in this section I will present the solution to most low grade wrist and ankle injuries that can occur in the martial arts. Of course should you injure yourself your first port of call should be a doctor or the hospital. These techniques can reduce pain and discomfort in cases of tendinitis and light sprains, but won’t fix a broken bone. Make sure you get yourself checked out by a medical professional. There are two primary causes of wrist and ankle pain with martial artists – poor technique and impact damage. The best way to correct this is of course with concentration and training of proper alignment (see x-ray’s below) and steady development of the supporting muscles around the joint’s through progressive resistance training. That’s all well and good but if you’re in pain now and want a solution it’s a question of too little to late. 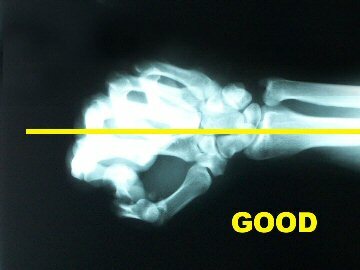 The wrist and the ankle are very similar mechanisms. They are work using a series of small interlocking bones called carpals. These tiny fragile bones work like a loose hinge, allowing the primary flexion and extension of the wrist and ankle (the “Paint Fence” motion for you Karate Kid fans), as well as little side to side movement and some circular rotation. All in all a pretty cool joint structure – but one that is very easy to damage. If the joint is misaligned the carpals take an uneven amount of pressure causing them to strain as if you were trying to bend a zip sideways. This means the small tendons of the wrist have to stand up and reinforce the wrist or ankle. Unfortunately that’s not their primary job and often times we over load them, leading to small stress tears in the tendon’s tissue. Tendons take longer to heal then most muscle injuries because they contain a lower blood supply and so don’t have the rebuilding resources present in our muscles. (This is also the reason many bodybuilders and overly muscular martial artists /athletes succumb so easily to injury they don’t have the tendon strength to support the muscle structure). From a Chinese medical perspective when we receive a blow or injury it often presents as “Qi and Blood Stagnation”. Before you start to go “Whu?? ?” this weird phrase actually makes a lot of sense. Remember Chinese Medicine speaks in metaphor based on interpretation of the outside world. Qi, the fundamental energy of the body becomes blocked at the point of impact – it is suspended. Blood is a manifestation of Qi and it too becomes suspended and stagnant. You’ve actually seen this happen dozens of times – your blood will become stagnant and stop moving at the location of an injury – it’s called bruising. The natural flow of blood through the capillaries has been broken, blood pools, and becomes stagnant that’s all a bruise is. See it’s not that far fetched. Essentially from a Chinese Medical perspective there has been a car crash on the energy motorway (blood supply) to your wrist or ankle and now cars keep driving into the crash site making it worse (pain). What you are about to do using Acupressure is clear that crash site. Spend 10 minutes, 3 times a day for a few weeks massaging the painful wrist or ankle using the following points and methods. Now that your wrists are rejuvenated, and your ankles alive with the flow of energy, you can get back on track to your regular routine and training. Speaking of getting back into it, next issue I’ll be discussing low back ache and the problems developed from poor stance , grappling injuries and why chairs are one of the worst inventions when it comes to our health. You have been reading about Acupuncture for Martial Arts Wrist and Ankle Injuries. It may interest you to read about Acupuncture for Martial Arts Bad Back Injuries Here.